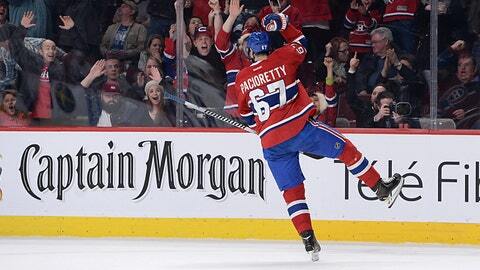 Max Pacioretty played hero for the Canadiens Saturday night. Max Pacioretty scored his second goal of the game on a power play 3:28 into overtime to lead the Montreal Canadiens past the Toronto Maple Leafs 4-3 on Saturday night. In their past seven games, Kessel has six goals and eight assists, while van Riemsdyk has five goals and six assists. The Maple Leafs are 6-1-1 in their last eight games. With the Leafs trailing 2-1 going into the third period, van Riemsdyk got his second goal of the game on a short-handed breakaway at 5:28. Five of van Riemsdyk’s 26 goals this season have come against Montreal. Tyler Bozak sent Kessel in on a breakaway to beat Peter Budaj at 7:43. But Subban tied the game with a shot from the point on a power play at 10:52 to force overtime. Bernier was called for Toronto’s third delay of game penalty at 3:14 of OT and, seconds later, Pacioretty ended the game. It took the Maple Leafs until 14:38 of the first period to get their first shot on goal, but they held Montreal to a 2-1 first-period lead. Galchenyuk put a spin-around shot from the slot past Jonathan Bernier 12:38 in and Pacioretty scored on a backhander at 14:02. But the Leafs sprang to life and, after Joffrey Lupul hit a post, Kessel slipped a pass that van Riemsdyk deflected at the net, only to see it go in off Budaj at 17:34. NOTES: Montreal’s Ryan White missed his second game with the flu, while Carey Price (lower body), Brandon Prust (upper body) and Michael Bournival (concussion) were also sidelined. Francis Bouillon was scratched. … The Maple Leafs called up Peter Holland from the AHL and he centered the third line, bumping Nikolai Kulemin to the wing. Dave Bolland remains out with an ankle injury. Colton Orr, Trevor Smith and Paul Ranger didn’t dress.